The 80 “contestants” recruited by the researchers were told they were going to take part in a TV show called “Zone Xtreme” and signed contracts agreeing to administrate increasingly powerful electric shocks to another person – actually an actor who was pretending to received jolts. Once the participants had been placed in the TV studio, resembling famous TV show sets, the actor identified as “Jean Paul” was strapped into an electric chair in an isolated booth. The participants were told to inflict him increasingly electric shocks, rating from 20 to 460, if he failed to answer correctly word association questions. Contestants couldn’t see Jean Paul’s reaction and neither the audience. As you already know (if you frequently visit this blog) this experiment was based on one carried out at Yale’s University in the 1960s. It was conducted by the psychologist Stanley Milgram and wanted to look at how normal people can commit atrocious acts, simply because they are following orders. The main difference between both experiments is that the one made for TV combined Milgram’s use of authority with the bountiful and astonishing power of live Television. Egged on by an undaunted presenter and influenced by the presence of a crowd overbearing in the studio, an overwhelming majority of the contestants continued with the experiment to the full of 460 volts. 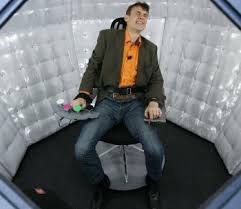 Despite hearing the other contestant’s (actor) pleas to get him out of the cubicle and to finish the game, only 16 out of the 80 participants stopped before inflicting the last electric shock. Even when the actor didn’t answered and fell silent, almost like he had lost consciousness or had died, the vast majority of the contestants got more nervous, but continue with the jolts. 80% of the participants, in comparison with the 63% enrolled on Milgram’s experiment, delivered the highest punishment voltaje. Christophe Nick, the producer, and the researchers involved in the experiment were disturbed by the results. “These were people like others, not exceptional, but 80% of them let themselves be drawn into becoming torturers”, said Jean-Leon Beauvois, a psychologist taking part in the documentary, to the BBC. Although “Le jeu de la mort” makers were sure that reality television instigates cruel acts and questionable methods to boost ratings, they were surprised that 64 out of the 80 contestants, influenced by the audience and hostess’ pressure, had been capable of nearly “killing” someone. This is not the first time European TV has tested its limits. In the Netherlands, in 2007, a game show titled the “Big Donor show” offered a Kidney as a price. Its objective was to make people aware about the savagery on TV, as well as, about those people awaiting for organ transplants. After the show, 12.000 people registered as organ donors (triplicating the normal average for a month). The French documentary made an impact on the audience, but also on contestants. Some of them felt emboldened by the show, while others were close into tears after realising what they had done. “How will I tell my husband and my children what I’ve done?”, a woman asked. This entry was posted in Sin categoría and tagged Le jue de la mort, obedience to the authority, Stanley Milgram, The Game of death, TV by Marina Force-Castells. Bookmark the permalink.